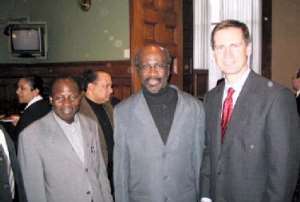 Premier Dalton McGuinty organized a multicultural reception at the Queen's Park Legislative Assembly in honour of the representatives of the National Ethnic Press and Media Council of Canada of which the Ghanaian News is a member on the 7th of April 2004. This was an opportunity for the Premier to interact with the 'mouth pieces' of the Canadian mosaic. In his official welcome and remarks he quipped a joke “I know we had a little bit of a step backward over the weekend, but let's hope spring is here to stay, Many of you will celebrate Khaba Day, Passover or Easter to name just a few”. In the list of significant celebrations, happening over the next few months speaks of the diversity of Ontario; the Premier stated. The Premier, the leader of the most populous province in Canada, described diversity as the tread that binds over social fabric, gives us our character, our heart and also a tremendous economic advantage. Beholding the diverse population of Canada represented in one big room during the function, Premier McGuinty stated, “Collectively, Ontario speaks every language, relates to every culture, understands every market, which he emphasized is the denominator and a valuable resource that reanimate Ontario in the global economy. He apparently struck a keynote that immigrants desired to hear more from the Gov't on placement of immigrant professionals in Canada. “My government is committed to making sure that highly qualified, internationally trained trades people and professionals can work in their chosen field, here in their chosen province” he closed. In his bid to build a communal bridge for posterity in every positive area of life in Ontario, the Premier desired that communities be connected to the present as well as to the future in order to facilitate good citizenry. He decried every element that would destroy amalgamation, “let me assure all of you, racism and the spread of hate will not be tolerated in this province”. The array of multicultural representation enjoyed multicultural stretch of sumptuous nurture amid mutual exchange and familiarization. Many a lot posed for pictures with the Premier, the people's man.